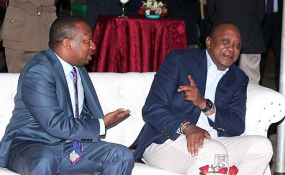 President Uhuru Kenyatta and Nairobi Governor Mike Sonko at KICC on December 22, 2017. Nairobi Governor Mike Mbuvi Sonko took to Facebook to ask residents whom he should pick as his deputy following the resignation of Mr Polycarp Igathe in January. The 22 people who made it to the list include key personalities such as President Uhuru Kenyatta's brother Muhoho, Uhuru's personal assistant Jomo Gecaga and deputy chief of staff Njee Muturi. "Great people of Nairobi, some say politics is about numbers. This FB page of mine has over 1,300,000 fans out of which 925,892 are Nairobians. I believe it is you the great people and God who have the powers of nominating leaders. Hence hebu munisaidie hapa (help me decide) whom do you think deserves to be deputy governor?" the post read. Others included in the list are Ms Ann Kiguta, a TV presenter at Royal Media Service, deported lawyer Miguna Miguna and Nairobi education youth and gender affairs executive Janet Ouko. Others are Ms Agnes Kagure Kariuki, former assistant minister Bishop Margaret Wanjiru, former Dagoretti MP Mr Dennis Waweru and nominated MP Millicent Omanga. A former Chairman of the Nairobi Central Business District Association Timothy Muriuki advised Mr Sonko to appoint somebody well versed with business. "I vouch for Mrs Agnes Kagure Kariuki the award winning Insurance expert," he said. Also in the list are former Nairobi Town clerk John Gakuo and Ms Karen Nyamu, a lawyer and who unsuccessfully contested the Nairobi Woman Representative seat. Mr Jimnah Mbaru, the chairman Dyer & blair investments and who attempted to be governor in 2013 is also in the list, as well as Mr Raymond Matiba, the son of former opposition chief Kenneth Matiba. Some Nairobians picked Prof James ole Kiyiapi who was in the 2013 presidential contest. Interestingly, Mr Igathe is also included in the list as well as Ms Esther Passaris, the Nairobi Woman Representative. Former Infrastructure PS Irungu Nyakera, Ms Susan Matiba and Ms Rachel Shbesh, who is the chief administrative secretary in the Ministry of Gender and Youth is also mentioned. Others are Mr George Kariuki and former Kamkunji MP and current East African Legislative Assembly Member Simon Mbugua.